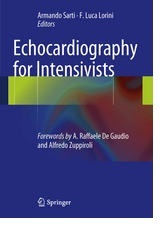 This book contains all the information that readers will require in order to perform echocardiography and to interpret the findings correctly. After an introductory chapter on the essential physics of ultrasonography, standard echocardiographic examination via both the transthoracic and the transesophageal approach is described. In the third section, the functional anatomy of all normal and pathologic thoracic structures as observed on echocardiography is presented in detail. A wide range of basic and advanced applications of echocardiography in the emergency and intensive care setting are then described. A final supplementary section considers further applications of ultrasound in the intensive care unit. This superbly illustrated book has been specifically designed to meet the needs of all intensivists, emergency physicians, and anesthesiologists who intend to use ultrasound extensively to guide optimal management of the critically ill.